i've only put this here as this is a very hard to find but very tatsy cider ( unlike strongbow, blackthorne in my opinion ). you will some times find it served as a guest cider in some wetherspoons for £2.59 a pint. but if your pub does not serve it. then this case is a must for real cider lovers. Have some heat, this is by far the best cider produced in the UK. I love this stuff, but this isn't very cheap. Try Lilleys instead, you can get 12 bottles delivered for £31.43. They sell 8 different ciders from gwynt y ddraig, the wetherspoons in Wales often sell gold medal too which is a nice change. Gwynt is brewed a mile from my house! Great cider. I'm confused.... is this Welsh or English cider ? Wetherspoons are selling it for £1.99 a pint at the moment as part of their beer festival (ends on Sunday though). 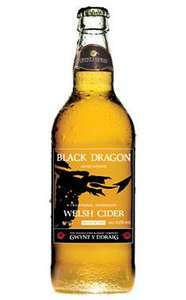 reasons for me posting was............ unless you live near a wetherspoons that sells it, or if you live in wales then this cider is very hard to get hold of, plus if you buy it in a pub you can hardly order it to go. plus most pubs near me ( wirral area ) charge around £3.20 upwards for a pint of cider. so for those reasons i posted it. sure the price isn't fantastic. put its not exactly over the top. what i thought made it a great deal was no matter where you live you can get it and drink it when you want without having to go to the pub ( if you are lucky enough to have a pub near you that sells it. This is really lovely cider. Always get some when I'm in Wales. Sadly, can't find it in England. Not sure this is that great a deal though, at that price I'd rather by some Aspalls, Westons Vintage or Dunkertons. Voted hot for the cider, not for the deal. This is really lovely cider. Always get some when I'm in Wales. Sadly, … This is really lovely cider. Always get some when I'm in Wales. Sadly, can't find it in England.Not sure this is that great a deal though, at that price I'd rather by some Aspalls, Westons Vintage or Dunkertons.Voted hot for the cider, not for the deal. like i said i know the price isn't great per pint, but it aint too bad. reason for posting is so people know where to get it from when not living any where near that sells it. be it pub or supermarket. like i said i know the price isn't great per pint, but it aint too bad. … like i said i know the price isn't great per pint, but it aint too bad. reason for posting is so people know where to get it from when not living any where near that sells it. be it pub or supermarket. Understood that bit, but I'm saying that for £3.30 for a 500ml bottle there are other great ciders out there which are just as nice and are around half that price. Understood that bit, but I'm saying that for £3.30 for a 500ml bottle … Understood that bit, but I'm saying that for £3.30 for a 500ml bottle there are other great ciders out there which are just as nice and are around half that price. i've yet to find a cider that i like as much as this 1. and as i'm not a big drinker 12 bottles would last me a few months. would rather pay £3.30 for a bottle of something i like and £2 for a bottle of something that i think is ok at best. I can't buy this near me (midlands), probably hardly anywhere outside Wales, and spoons don't have it that often. I think its nice to see some more cider drinkers around, was starting to think I was the only one! I prefer this to most bottled ciders I can get in the Midlands, maybe because its harder to come by? I dunno, but whenever in Wales I drink this. As I said though its cheaper at Lilleys, and they also do some other nice ones. EDIT: I do drink a few bottles a day though, so need to keep the price down! This is a fantastic cider. Just a touch of sweetness mixed with an oakey barrel taste. My favorite by far. Lucky wetherspoons in Exeter stock it very regularly. Defiantly a must try for real cider lovers bored by fizzy commersial ciders.